I always thought that computer games were a negative influence. Little boys using play stations to shoot down ‘baddies’ or other ‘monsters’ that I believed was a complete waste of time and was turning youngsters into a generation of ‘couch potatoes’, trivialising guns and violence. But some of our staff were urging us to allow computer games at the POP Centres, so I decided to do some research. The more I read about the playing of computer games, the more intrigued I became. I’ve read articles, I’ve watched TED lectures. I’ve listened to Jane McGonigal Director of Games Research and Development at the Institute of the Future and have been persuaded that the world of ‘Gamification’ is a powerful weapon in the fight against poverty. I hope I can convince you to. I have been told and shown statistically by experts that playing games builds Physical, Emotional, Mental and Social Resilience. That is exactly what we want to build in our young people. Gamification is one of the most useful methods of stimulating and exercising the brain and can engage young people in activities such as problem solving that could profoundly affect their lives. 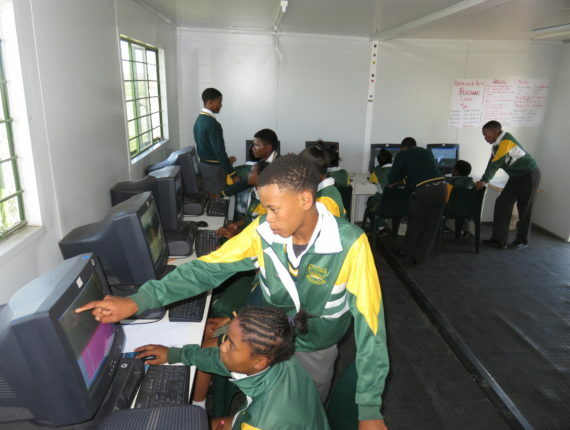 We have nine POP Youth Centres, each with a computer room. They range from very well equipped to average but all Centres are equipped with smart TVs. We can and should be encouraging the playing of computer games. BUT these computer rooms in the POP Centres can do more, much more. I don’t have to tell you how amazing computers are and that with access to the internet you have the world of information at your feet. Don’t worry we have blocked many sites! I have a conviction that if I can get our computer rooms at all the nine POP Centres to work to maximum capacity (i.e. from early morning to the evenings) we will make a big impact on poverty in rural villages. My dilemma is how do I get the best out of these computers ALL THE TIME? These complicated little machines need looking after, guarded against misuse, serviced regularly, have enough band width to satisfy the needs of hundreds of children and be equipped with legal software including anti-virus programmes. R900 and the back up service is about R 750 per month depending on how far the technician needs to travel. I hope that you agree with me, that having access to a well-functioning and meticulously maintained computer room can work wonders, developing the brain, improving homework, learning a skill, or finding a job and many other useful purposes. I hope too that you would be happy to support the computer rooms with a donation.